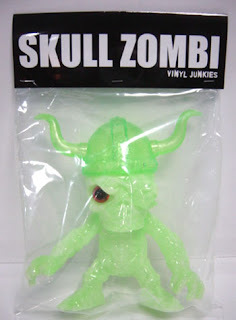 In this blog I am going to list some of my favorite vinyl collections, with all info I have on them, starting 1st with Vinyl Junkies Skull Vikings. To my knowledge all were released in 2007, the 1st one in April. If you have any info on these (as it it hard to come by) or if I have something wrong, please let me know. Any comments are welcome. Header card for ALL VIKINGS, front & back. Black SuperFestival 42 ltd. March 2007 This also came with a magenta eye.